Directnic is a popular domain registrar because of the easy-to-use domain management tools. It is easy for webmasters to monitor and register multiple domain names. Also, the simple pricing keeps payment less of a hassle. Directnic offers web hosting and SSL certificates as well. Directnic has great deals and offers. They are definitely worth checking out to see if they could be the best domain registrar for your needs. Read our Directnic review to learn more about the domain name registration and other domain services they offer. Directnic does a great job of making it easy to select a domain name. Choosing the right domain name for your website is one of the most important decisions you will make when building a website. Every person that accesses your website will have to know your domain name or be able to find it easily in search engine results. Choosing a word that is relevant to your content, easy to spell, and easy to remember are some of the essential things to consider. Directnic provides a simple domain search bar that allows you to put in a couple of keywords that are relevant to your personal or business website and then they return you a whole bunch of suggestions for domain names that would be good for those keywords, and the pricing for each option. They also provide some “best practice” tips for selecting a domain name that can help you with this crucial decision. With the new top level domains (nTLD) approved by ICANN (Internet Corporation for Assigned Names and Numbers), Directnic has many options to help you get the right domain extension for your business and industry. Dozens of new domains have been released already with hundreds of others to be released in the future, depending on interest and demand. If there are specific domains that you are waiting on, Directnic makes it easy to create a watchlist and even submit a pre-order for a domain that you want. You can also submit a domain you are interested in on their Expression of Interest page to let the powers that be know that it is a domain that is in demand. At the time of this Directnic review, Directnic does not participate in the Sunrise or Landrush phases of registration. The Sunrise domain registration phase is exclusive to entities that have a registered trademark for the domain. The Landrush period is when the domain first becomes available to the public but is often offered first, at a premium price, to those parties that have pre-registered or shown a specific interest in the domain. After that is the general registration phase, this is when the domain name will become available for registration through Directnic. As part of the domain registration process, ICANN requires contact information for each domain including name, address, and phone number. This information is publicly available through the WHOIS records. Not everyone wants this information to be made public because it leaves their information visible to possible spam or scam attacks. Directnic offers private registration, known as Direct Private, that will hide this information in the WHOIS listing and replace it with the registrar’s information. 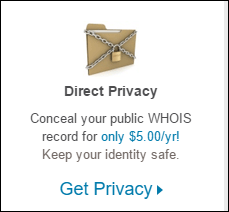 This satisfies the requirement for ICANN while keeping your personal information private. The domain is still owned solely by you and you have complete control of it, but your information is not published publicly. The current price for this option is just $5 per year. With so many domain name options available it is impossible for us to give you a comprehensive list of pricing for domain registration through Directnic. As you know, domain registrars run special discount pricing or coupon codes for domain registration as well, so please check their site directly to find out about the most current pricing and promotional offers that are available. Below is a sample of the current domain registration pricing they have listed on their site for a few of the popular new TLDs. If you already own your domain but are looking to switch to another provider, Directnic also offers domain transfer services. See the website for current pricing on the specific domain name you wish to transfer to Directnic. Overall, we have been very impressed with the domain name registration services offered by Directnic and we consider them one of the best domain registrars in the industry. Directnic also offers bulk domain registration, if you have multiple domains you are interested in registering. Visit the Directnic site for complete details and current domain registration pricing.